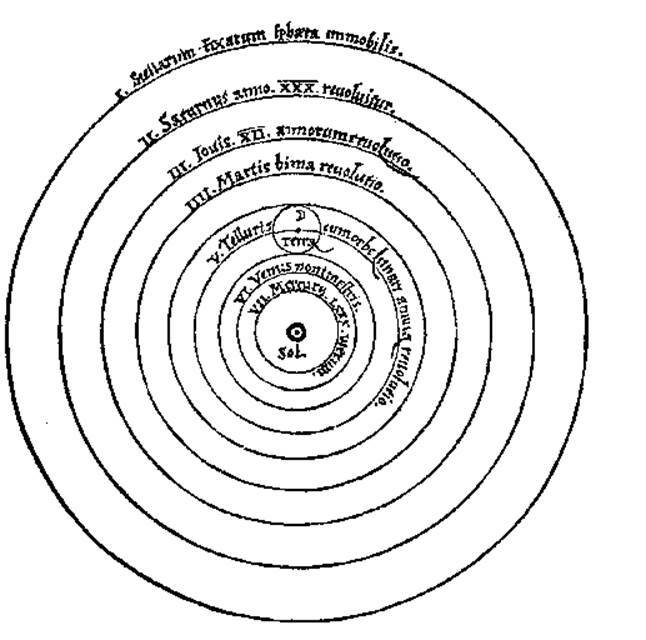 Ptolemy’s picture of the solar system was almost fully accepted for the next fourteen hundred years, to be challenged by Copernicus (real name: Nicolaus Koppernigk) a mathematician and astronomer with a Polish father and a German mother, in 1530. Copernicus’ picture of the solar system had the sun at the center, and the earth went around it, as did the other planets. We show here the picture from his original publication. Notice that the only exception to the rule that everything goes around the sun is the moon, which continues to go around the earth. One objection to the picture was that if the earth was indeed just another planet, how come it was the only one with a moon? Other objections were based on the Aristotelian point of view—it was difficult to believe that all the other planets were composed of aither, and the earth of the other four elements, if they were all behaving in so similar a fashion. A further objection, which had long ago been raised by Aristotle to the idea of a rotating earth, was that the stresses would cause it to fly apart, and furthermore, anything thrown in the air would land far to the west. Despite these problems, Pope Clement VII approved of a summary of Copernicus’ work in 1530, and asked for a copy of the full work when it was available. This was not until 1543, the year Copernicus died. As Copernicus’ new picture of the universe became more widely known, misgivings arose. The universe had after all been created for mankind, so why wasn’t mankind at the center? An intellectual revolutionary called Giordano Bruno accepted Copernicus’ view, and went further, claiming that the stars were spread through an infinite space, not just on an outer sphere, and there were infinitely many inhabited worlds. Bruno was burned at the stake in 1600. The real breakthrough that ultimately led to the acceptance of Copernicus’ theory was due to Galileo, but was actually a technological rather than a conceptual breakthrough. It was Galileo’s refinement and clever use of the telescope that persuaded people that the moon was a lot like the earth, and in some ways, so were the planets. The first known use of a magnifying glass to aid in reading was in the 1200s, by Roger Bacon at Oxford. It proved a boon to aging scholars, many of whom had been forced to retire while still relatively young. The idea spread throughout Europe, and Italian craftsmen, were making glasses for old men before 1300, (lens means lentil in Italian, so called because of the shape of the pieces of glass used) and for the myopic young not until a hundred and fifty years later. The reading glasses for the old men, who were longsighted, were convex lenses, (bulging in the middle like () ), whereas the glasses required by the shortsighted young were concave lenses, thinner in the middle than at the edges like )( , and hence more difficult to make and not so robust. The first time, as far as we know, that anyone put two lenses together to make a telescope-like optical instrument was in 1608, in Holland. The inventor of an opera-glass like telescope was called Lipperhey. He was unable to get a patent, however, because his invention was deemed too easy to reproduce. Perhaps the reason it had not been done before was that to get magnification, one needs a concave lens stronger than the convex lens being used with it, and commonly the lenses in wide use were the other way around. Galileo found out about this invention in the spring of 1609, and immediately set about improving it. He saw it as a possible way out of his financial difficulties. He was an oldest son, and so was responsible for his younger sisters’ dowries. He also had three children of his own, by his mistress. At the time, he was a Professor of Mathematics in the University of Padua, in the Venetian Republic. He soon put together a spyglass with a magnification of three, which many other people had already done. Galileo was an excellent experimentalist, and working with different lenses, he realized that the magnification was proportional to the ratio of the power of the concave (eyepiece) lens to the convex (more distant) lens. In other words, to get high magnification he needed a weak convex lens and a strong concave lens. the problem was that the opticians only made glasses in a narrow range of strengths, and three or so was the best magnification available with off the shelf lenses. Galileo therefore learned to grind his own lenses, and by August, he had achieved about ninefold linear magnification. This was an enormous improvement over everything else on the market. Galileo therefore approached the Senate of Venice to demonstrate his instrument. Many senators climbed the highest belltowers in Venice to look through the glass at ships far out at sea, and were impressed by the obvious military potential of the invention. ....(the telescope is) one of the fruits of the science which he has professed for the past 17 years at the University of Padua, with the hope of carrying on his work in order to present You greater ones, if it shall please the Good Lord and Your Serene Highness that he, according to his desire, will pass the rest of his life in Your service. It is nice to report that Galileo was granted tenure, and a reasonable salary, but—the bad news—with a proviso that further raises would not be forthcoming. 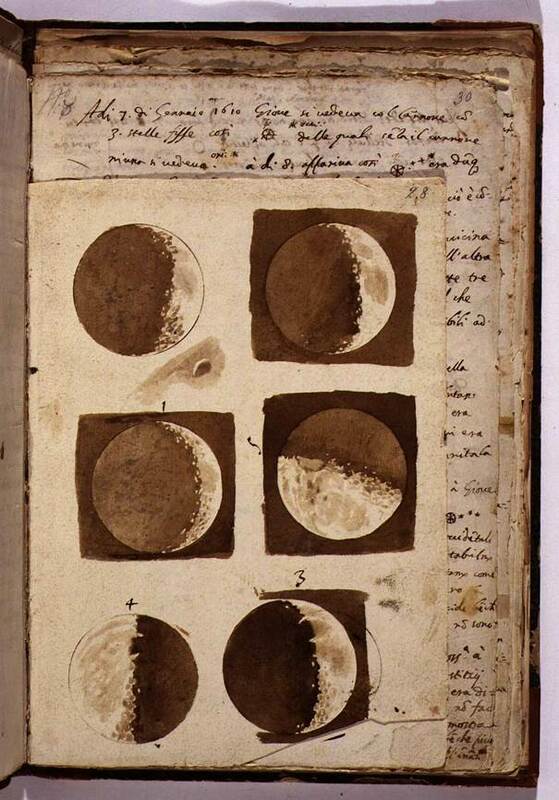 Galileo’s first major astronomical discovery with the telescope was that the Moon’s surface is mountainous, and not a perfect sphere as had always been assumed (see his drawings in Sidereus Nuncius). He built a convincing case for the reality of the mountains by sketching the appearance of parts of the Moon’s surface at different times of the month, that is, under different angles of lighting, and showing how the light and shadow seen could be simply and naturally accounted for topographically, rendering the prevailing theory at the time, that the variations in light arose from something inside a perfect sphere, a cumbersome and unappealing alternative. This caused an uproar. From the National Central Library of Florence (BNCF). He was able to estimate the height of the mountains on the moon by seeing how far into the dark part bright spots could be discerned. At half moon, a little geometry is enough to calculate the heights! Galileo himself worked an example: suppose a bright spot, presumably an illuminated mountaintop, is visible one-twentieth of a moon diameter into the dark side, at half-moon. Then the picture is as shown here (and is taken from Sidereus Nuncius). The light from the sun fully illuminates the right-hand half of the moon, plus, for example, the mountaintop at D. (GCD is a ray from the sun.) 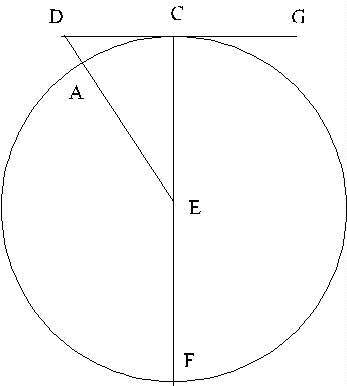 If the base of the mountain, vertically below D, is at A, and E is the moon’s center, this is exactly the same problem as how far away is the horizon, for a person of given height on a flat beach. It can be solved using Pythagoras’ theorem as we did for that problem, with the center of the moon E one of the points in the triangle, that is, the triangle is EDC. A problem with asserting the existence of mountains is the apparent smooth roundness of the edge of the Moon, for which Galileo had two arguments. First, ranges behind those on the edge would tend to fill in the gaps. This is correct. Second, maybe things were fuzzed out by the Moon’s atmosphere. This is wrong. Galileo’s next major discovery began with his observation on January 7, 1610, of what he took to be a rather odd set of three small fixed stars near Jupiter, and, in fact, collinear with the planet. These stars were invisible to the naked eye. He looked again at Jupiter on successive nights, and by the 15th had realized that he was looking at moons of Jupiter, which were going around the planet with periods of the order of days. This caused even more consternation than the demystification of the Moon. Seven was a sacred number, and there were seven planets, wanderers, or moving stars. Jupiter’s moons spoiled this. Furthermore, they suggested that it was o.k. to go in a circle about something other than the center of the universe, i.e. the Earth. This made Copernicus’ argument, that the Moon goes around the Earth and the Earth around the Sun, more plausible. Again, Galileo’s grantsmanship is admirable. In a masterstroke of public relations, he named the satellites after the Medici family, Dukes of Tuscany, where he applied for the position of mathematician to the court. He sent his most recent 20X telescope to the Duke, so that he could peruse the stars named after him and his brothers, and emphasized its military applicability.